Mitchell Wilburn is a native of Las Vegas, an obsessive gourmand, and a passionate expert on all things fermented, distilled, or fortified. 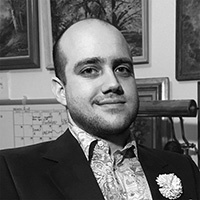 He has held positions as restaurant critic for Las Vegas CityLife, the Condé Nast Travel Network, and NPR’s Desert Companion Magazine, and has contributed to a myriad of trade publications, cocktail blogs, food-news sites, tourism magazines, and John Curtas’ own EatingLV.com. He even had an anonymous, unsanctioned, self-published counterculture futurist/transhumanist philosophy zine back in his days at the University of Nevada Las Vegas, and no, you may not see it.